Equality Illinois is hopeful that the General Assembly will act in its final days of the spring session to pass bills advancing LGBTQ civil rights, as well as passage, finally, of a responsible budget with adequate revenues to fund essential programs for all Illinoisans. 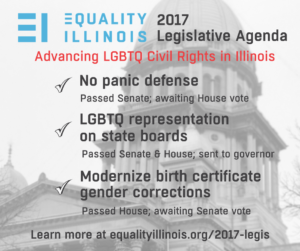 EI Director of Public Policy Michael Ziri and our advocacy team are talking to lawmakers to push for passage of bills such as HB 1785 to modernize the standard of birth certificate changes to help transgender Illinoisans and SB 1761 to end the anti-LGBTQ panic defenses in murder cases. As the last hours of the session unfold, stay on top of legislation important to LGBTQ Illinoisans on our Facebook page and Twitter feed, and here on our web page.